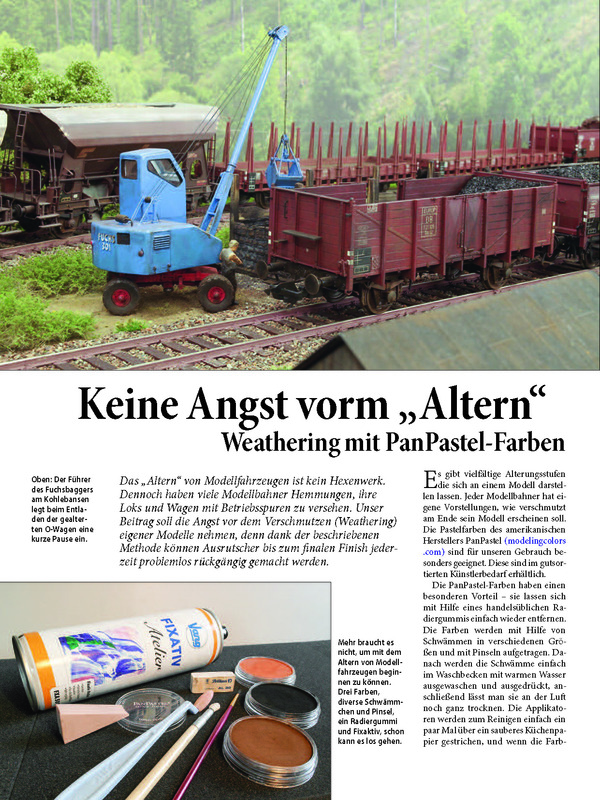 Thorsten Ströver’s article in the April 2017 issue of German magazine Eisenbahn Kurier features PanPastel for weathering. 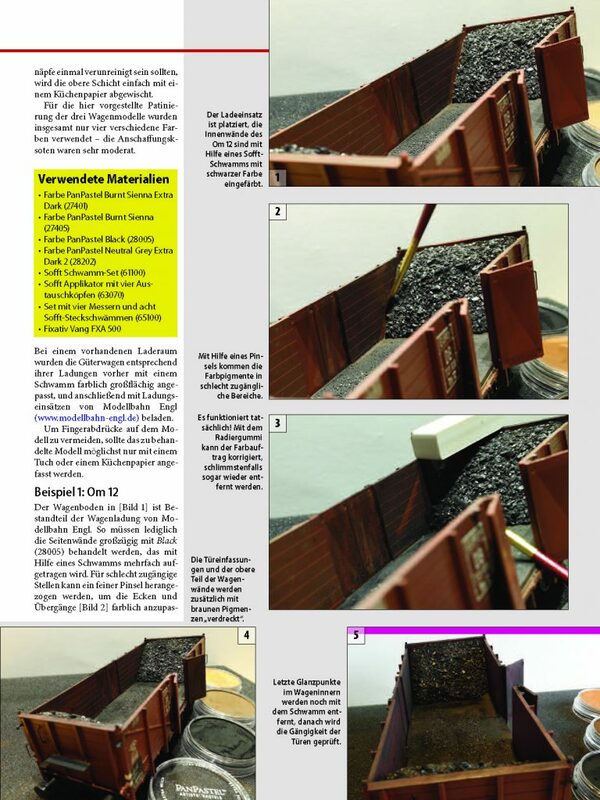 The 6 page article shows many of the techniques that Thorsten uses with PanPastel. 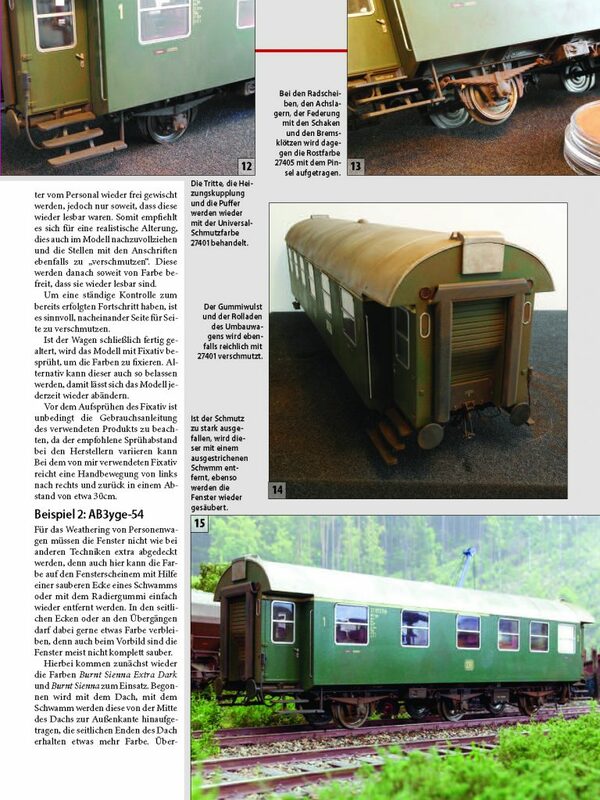 Even if you don’t speak German, the images speak for themselves and showcase the realistic weathering effects that Thorsten was able to successfully achieve. 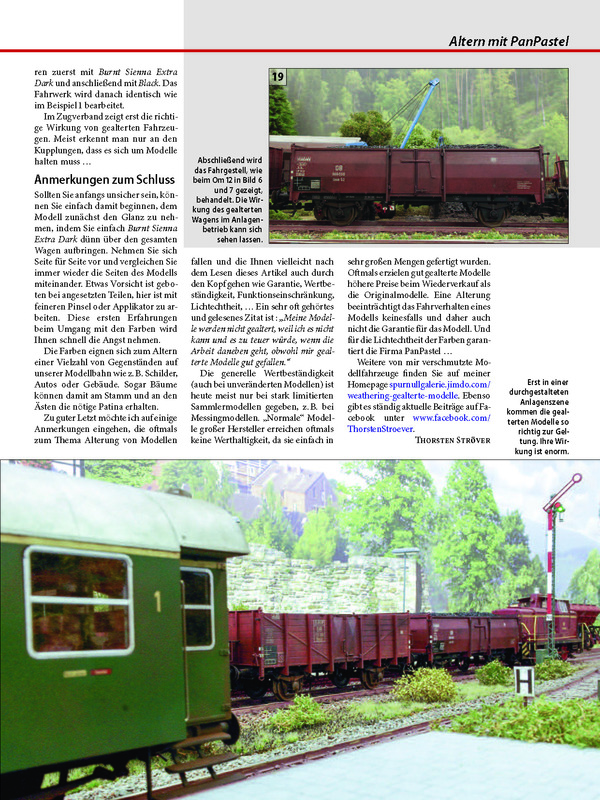 Note: for readers of US magazine “Model Railroader” – Thorsten is featured in the Trackside Gallery in the August 2017 issue. 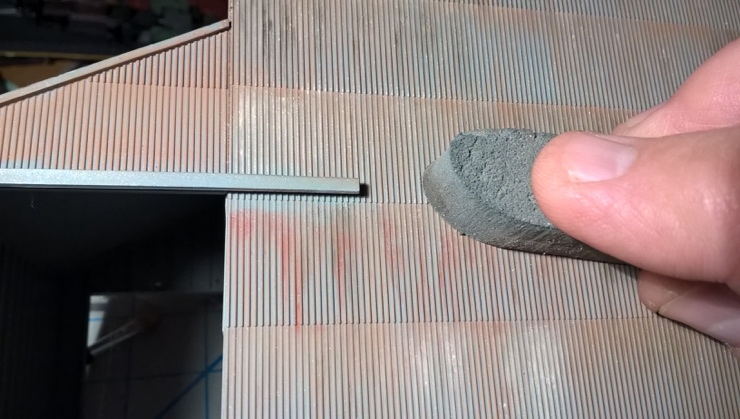 Apply PanPastel Neutral Grey 820.5 with Sofft Mini Applicator to represent weathered wood running board and hatches. PanPastel Neutral Grey 820.5 on wood running boards and platforms. Orange sides of reefer faded with Yellow Ochre Shade 270.3. Simulate ice and brine damage on upper corner and drain above truck and wheels using Pearl Medium White Fine 011. Other uses for White Pearl Fine and Coarse would be white caps on marine dioramas, waterfronts and rivers. I have a small diorama my wife, Bev, built for her covered bridge model. I plan on adding “water” to the creek and using the Pearl White Fine and Coarse 012 to create waves or foam on the top of the water. 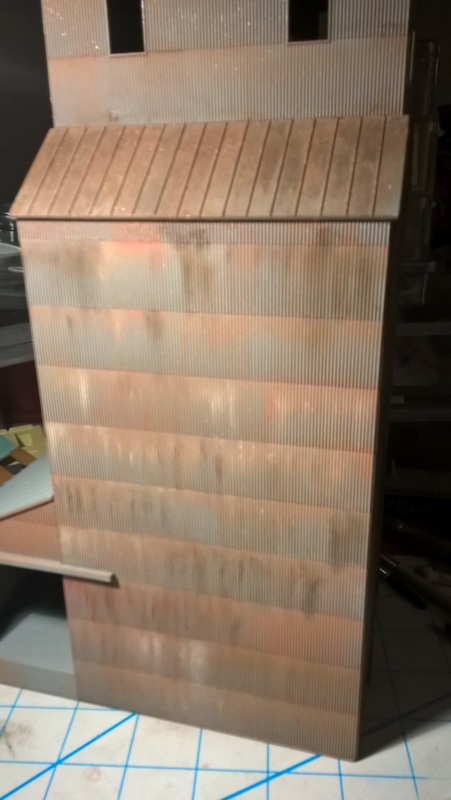 I’ll cover this in detail when I show you, in a future post, how to use PanPastel® for scenery construction. Congratulations to the winners of this giveaway: Jeremy Janzen, Reno and Dave Davenport. We are giving away a set of PanPastel Mediums which includes the Pearl Whites (featured above), Pearl Blacks (Coarse & Fine) and the Colorless Blender to three lucky winners. Enter the giveaway using the form below by Monday 24th October 2016, 11pm EST. THREE winners will be randomly selected and announced on our blog and Facebook page. I really haven’t covered structures in my blogs. 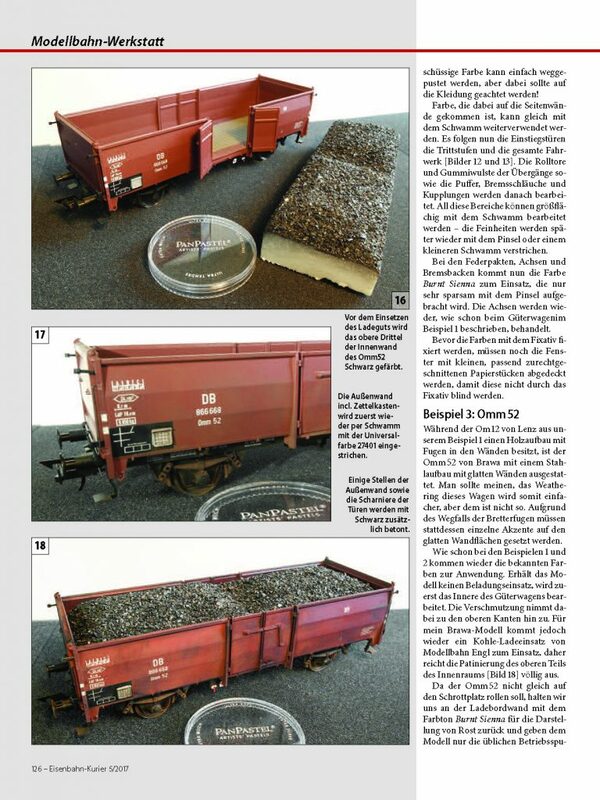 They are, in my opinion, one of the most important elements in model railroading. 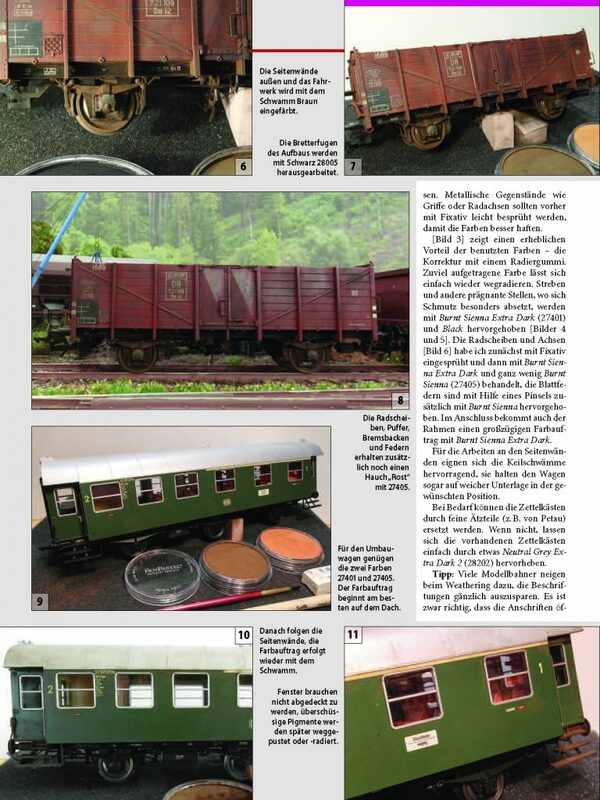 They are the setting for the trains we detail and weather. One of my favorite structures in the railroad realm is the country grain elevator. I have a nice collection of 35mm slides that I took starting in the seventies. I am sure many of these “Country Skyscrapers” are now gone. 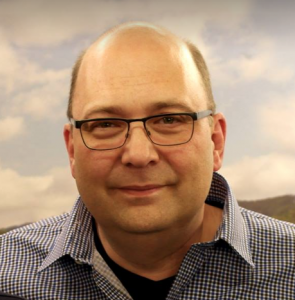 One of the best ways we can recapture those memories is by building a model of them. 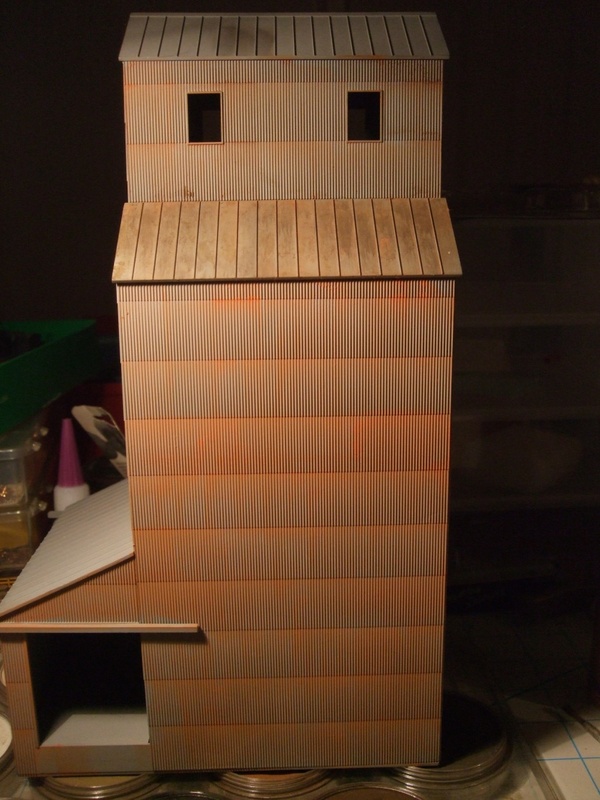 The model I chose for this portion is the Walthers® corrugated elevator. I primed it with a Light Grey acrylic. Originally meant to be weathered with washes, I procrastinated long enough to discover PanPastel® and use them instead. I am so glad that happened. Weathered with Sofft Sponge Bar and random colors from the PanPastel Rust & Earth set. Step 1. I started by using my Sofft® Sponge Bar by scrubbing on an overall covering of Burnt Sienna 740.5 and Burnt Sienna Shade 740.3. You have to really push the color into the corrugated grooves. The overall effect is to have the rust in the recesses and the high spots to be slightly polished by the wind. I then used random swipes of Burnt Sienna Tint 740.8, Raw Umber Tint 780.8, Red Iron Oxide Extra Dark 380.1, to name a few. Honestly, I work so fast I barely remember what colors I used. If an area looks too heavily colored I will keep brushing it down with one of my Sofft® Sponge Bars. If I want to tone it down further, I use the PanPastel Colorless Blender 010 as seen on the roof panel. The Colorless Blender will soon become one of your most used “Un-Colors”. It can also be used as a primer for lighter colors. Step 2. Next any stray excess color was blown off and a paper towel was used to lightly wipe the excess on the raised corrugations. This allowed the Pewter 921.5 and Silver 920.5 to accent the high spots as in real life. I then used the flat spongy side of the block to add the final overlay of Silver. This side took less than 5 minutes. Structures are not handled like rolling stock so a flat finish (spray) is rarely needed. Step 3. Add silver and Pewter to tops of corrugations. I’ve had these PanPastel® Metallic Colors for a while and I always thought they looked pretty cool. Lots of potential. A little hard to write about. 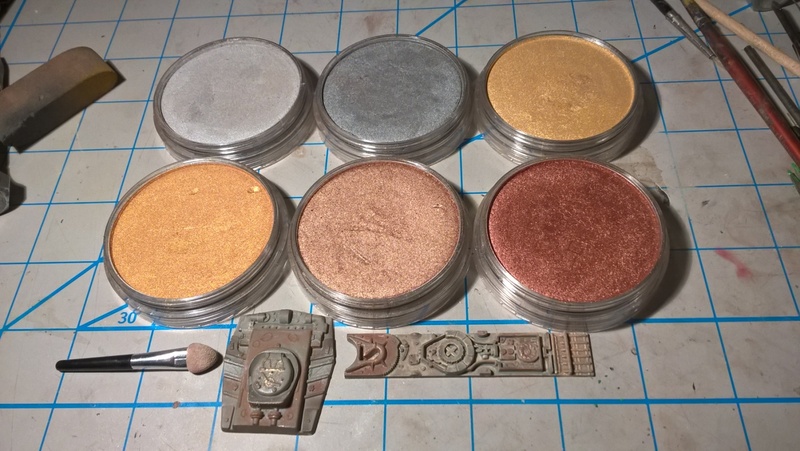 I guess it is because they are more subtle than the other colors we use in weathering our models. 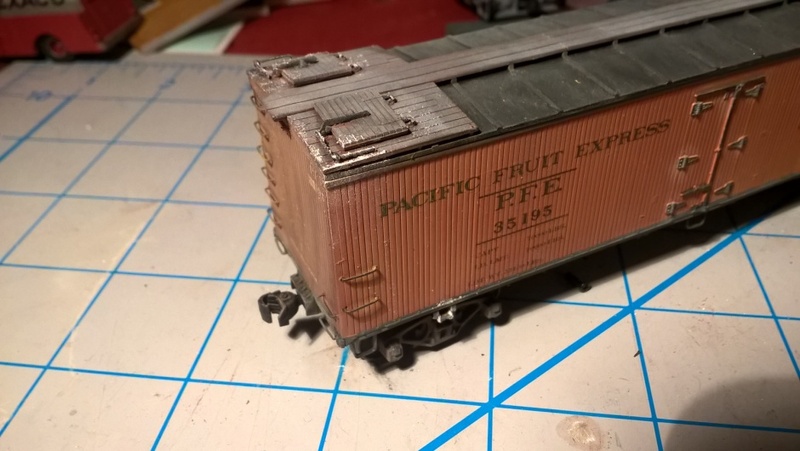 Now, I didn’t make an immediate reference to my obsession with freight car modeling. By models I mean the plastic kits that most of us started with like Revell planes, Monogram cars and Sci-fi kits. The colors have some interesting properties; they can add highlights to a model that add that “human” touch. A realistic sign that miniature folks left their mark on the model. Metal can show signs of rust, mud and dirt; it can also show signs of wear. Paint fails down to the metal when rubbed or gouged. This can be easily simulated with the swipe of a Sofft Tool®. Let’s talk about the Silver and Pewter first. 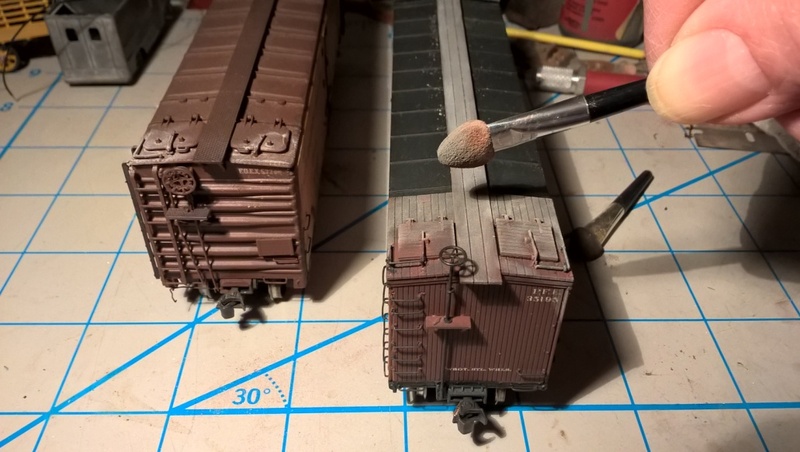 In a previous post I described the weathering of exposed galvanized sheet metal on boxcar roofs. The technique can also be used for structure roofs, corrugated sides like grain elevators, truck or trailer cargo areas.